Finance for Non-financial Managers, Second Edition (McGraw-Hill, 2014), still the premier resource for learning financial concepts, is now expanded in scope with even more tools to strengthen your financial acumen. Like the original, it’s written in non-technical, easy to understand language, clearly explaining the key elements of business finance. Going further, this book adds extensive material on investment decision making to evaluate new projects or re-evaluate existing ones. Often misused terms like Return on Investment, Internal Rate of Return, Discounted Cash Flow and Breakeven Analysis are discussed and applied in real world examples that most everyone can relate to. This is a must-read for anyone running a business or looking for career advancement. Once again, Gene’s conversational writing style makes complex concepts easy to understand and as a result easier to apply – in your current job or your next one. 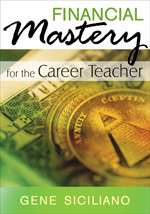 "Your book … had a tremendous impact on my career"
The money management book that no educator can afford to be without! Teaching has many rewards, including the opportunity to change young people’s lives and make a meaningful difference in a community every day. However, despite the important work they do, teachers often find themselves struggling to survive on a teaching salary. Start planning your financial future now so you can have a fulfilling career as a teacher and still come out ahead! Finance for Administrative Assistants is a must-have tool for those who are interested in broadening their business backgrounds as well as those who are in jobs that require a basic knowledge of financial matters. In today’s hyper-competitive business world, it is now more important than ever to achieve financial literacy – for both personal and business reasons. In this eBook, Gene Siciliano provides a brief overview of the inner workings of financial departments for those unfamiliar with finance, as well as interactive exercises that will help you reinforce the financial topics discussed. Included are sections on reading financial statements, understanding the difference between cash flow and profits, and the preparation, reporting, and analysis of a budget. Finance for Non-financial Managers, published by McGraw-Hill, is the premier resource for learning the financial concepts behind successful corporate management. Written in simple, easy to understand language, Gene Siciliano explains the key elements of business finance. Covering all the bases from financial statements to operating ratios to debt and equity financing, Gene converts these “scary” issues into approachable topics. Steering clear of archaic terminology, unexplained buzzwords, and hard-to-follow charts, Gene uses real world examples and a friendly style that makes the reader feel empowered, capable of tackling any financial issue that rears its ugly head.